BHU Entrance Exam Syllabus 2019: Banaras Hindu University (BHU) is a central university founded by Pandit Madan Mohan Malaviya. This university provides admission to various undergraduate, post graduate & diploma courses through UET (Undergraduate Entrance Test) & PET (Post-graduate Entrance Test). BHU 2019 admission for MBA course is started from 10 September. 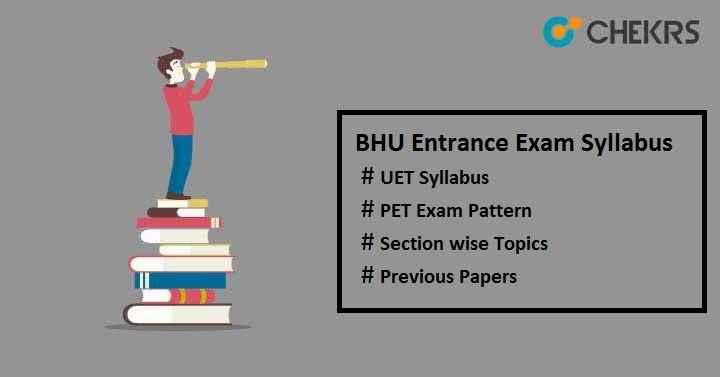 Admission in BHU is quite difficult; students will have to check BHU UET Syllabus thoroughly along with the BHU Entrance Exam Pattern to crack the entrance exam with good cutoff marks. Here we have provided the important topics to be covered for the entrance exam and exam pattern to help those students who are going to give this exam. The examination controller will set the exam pattern for each course. It varies according to the different courses. BHU Entrance Exam Pattern will give idea about the entrance exam and paper. It comprises the type of questions asked in the exam, marking scheme, no of questions, topics covered from each subjects etc. Marking Scheme 3 marks will be awarded for each correct answer. 1 mark will be deducted for each wrong response. To check the detailed exam pattern of all under graduate courses, Click Here and for all post graduate courses, Click Here. After completing the entire syllabus, candidates need to solve the Previous Year Question Papers to brush up their knowledge and also learn time management skills. We hope that above provided details will be sufficient and helpful for all candidates. For more details and query, you can drop your question in the below comment section. We will help you for sure. All the Best!! !